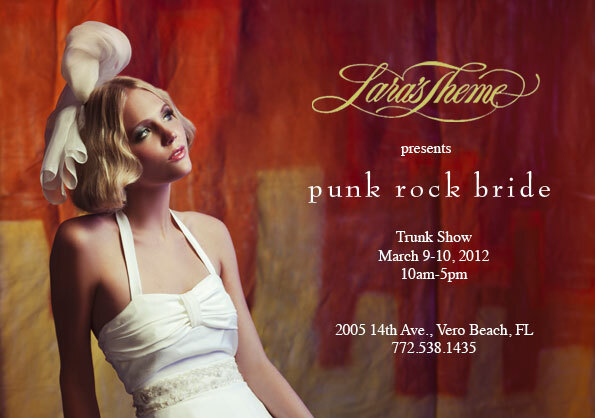 Friday’s Fabulous Finds ~ Punk Rock Bride Trunk Show at Lara’s Theme! Lara of Lara’s Theme is a very talented vendor I have had the privilege of working with in the Space and Treasure Coast of Florida a few times now. She always creates stunning floral arrangements, plans your wedding down to the last detail, and now has a gorgeous Bridal Salon that features beautiful gowns! So I had to share this great event that Lara is hosting at the salon. If you haven’t heard of Punk Rock Bride, they make fashion-forward dresses for the bride that is looking for something different on their wedding day. Two of my favorites from the 2012 collection are the Jessica and the Molly. These are stunning gowns, they are unique, and a whole lot of fun! Make sure to go and check it out! DC-based wedding dress company Punk Rock Bride will be making its first appearance in South Florida at Lara’s Theme Bridal Boutique. Their entire collection will be in the shop at 15% off. The designer will also be onsite for the weekend. Please call 772.538.1435 to schedule an appointment. *Please follow the link for more info on this photo provided by Lara’s Theme (not taken by me)!